Worried that your color choice may end up leaving your guests with a sour taste in their mouths? If you don't want it to end up looking like a Crayola box has burst all over your bridesmaids then avoid rainbow colors at all costs. A mix of vibrant, florescent shades in every color of the rainbow is overkill! Apart from guests finding it extremely difficult to decipher who is part of the bridal party, all eyes should be on you (not an easy task when there is such a mishmash of colors everywhere you look). If you love color and simply must have a rainbow theme, try a toned down version by sticking to one main color and having rainbow accessories and accents. Unless you're trying to revive the seventies, brown and yellow is a definite no-no. These two colors combined conjure up less than appetizing connotations. If you do decide to go with brown and yellow for your wedding color scheme, just make sure you don't serve up lemonade and fudge for your canapés! Whether you're getting married in fall or not, nobody should want their wedding to resemble anything even remotely related to Halloween. Spooky, scary, ghastly and creepy, are not the sort of words you want circulating between guests regards your wedding venue. There is a reason black and orange colors are reserved only for Halloween. 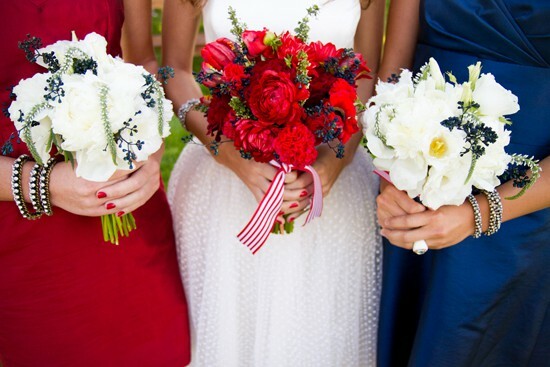 Red, white and blue makes you want to stand to attention and salute - that or you'll wind up creating a nautical vibe. Either way it's not very romantic is it? After all, this special day is supposed to be about the love you share with your bride/groom to be, not the love of your country. If you've got your heart set on these three colors, shake the shades up a little to avoid making the guests feel like they've just stumbled upon a Memorial Day parade. When you think about it, it really is hard to picture anything appealing that's brown in color. Okay there's chocolate but that's about it! Brown, tan, beige, whatever, they're all pretty lifeless and drab which is why you certainly shouldn't base your entire wedding color scheme around these varying shades. That being said, chocolate brown mixed with Tiffany blue or sweet pink can work pretty well together. It's all about finding the right combo. 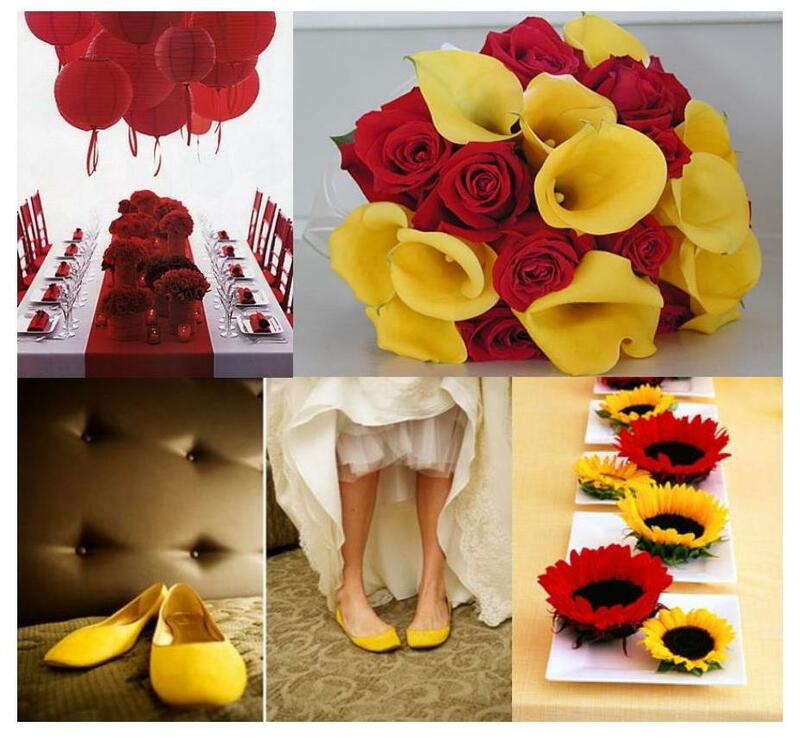 What's the first thing that comes to mind when you picture yellow and red together? This color combination is tacky to say the least. Do you really want your guests looking around the room wondering when Ronald's going to make his grand entrance? Try red and gold instead. This is a wedding not a funeral! Okay so you're a nonconformist. 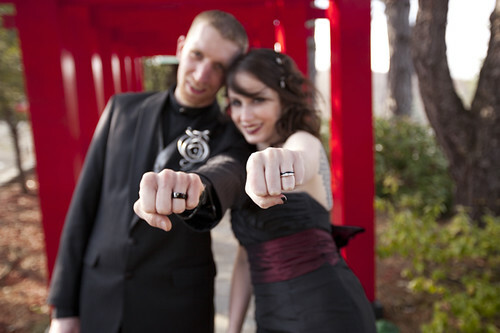 That doesn't mean you have to deck out your entire wedding in black to show people just how punk you really are. If the inclusion of black in your wedding color scheme is important to you, keep it minimal. Black can be pretty overwhelming, so just use it as an accent color alongside something a little more cheery. Similar to rainbow colored themes, using too many colors is a common error that many bride and grooms make simply because they can't settle on one or two. 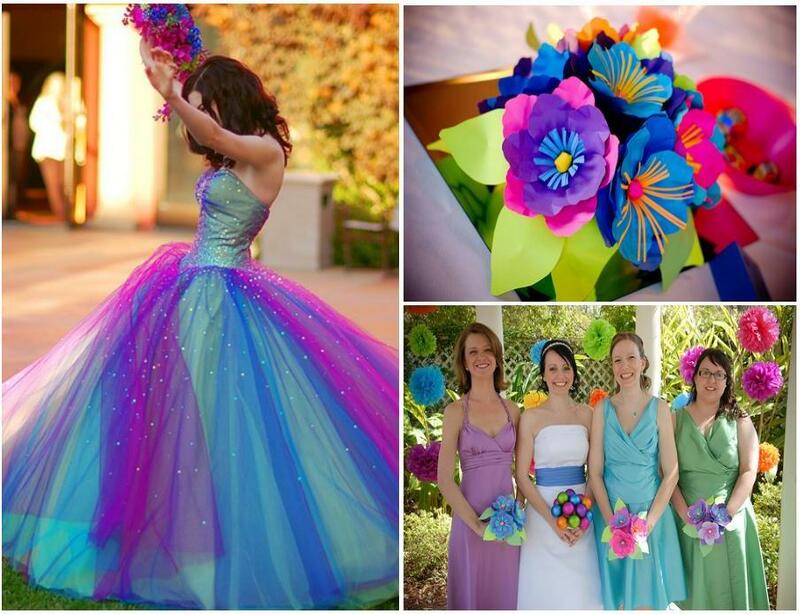 Having too many colors at your wedding can cheapen the feel and confuse the guests. 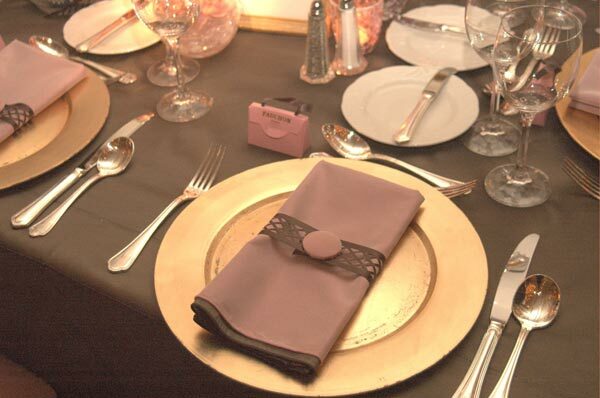 Simplicity is key when it comes to choosing wedding colors, so stick to three or four max! If you're having a hard time, pick two colors that are symbolic of both you and your partner. So you're considering having everything in pink? Pink bridesmaids, pink centerpieces, pink flowers, pink cake. This is your guy's day too. 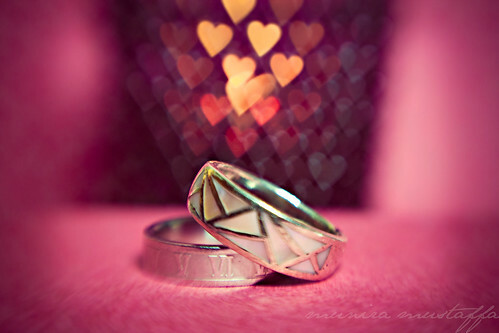 If he likes pink then by all means go crazy, but don't forget that this day isn't all about you. If you're a bit of a princess and know that no other color scheme will do then don't let us put you off. But take head, you could end up resembling Katie Price when she married Peter Andre - and that's never a good look! The recent popularity in Pinterest and Style Me Pretty weddings has pushed this color combo into the limelight. Don't get me wrong, I love vintage and shabby chic themed weddings (it's actually the look I went for with my own wedding), but it's not an easy one to pull off. Mixing white and ivory fabrics, adding in some mason jars, lace, old books, and buttons, isn't going to give you that instant vintage feel you're hoping for. At best you'll end up looking like your washing machine wasn't up to the task of getting the linen to come clean! The trick to getting this one right is to focus on layering various shades and textures of the same color. Just remember that at the end of the day it is your personal choice. Your wedding color scheme should reflect you and your partner. It is great to get outside views and opinions, but you should always stick with your gut instinct and choose the colors that make you feel happiest. Rest assured there is plenty of couples out there that have chosen each and every one of the above wedding color schemes and executed them with perfection.